I looked through some of my old travel journals and realized that what I have been missing in my recent drawings is the interaction between different drawings, the flow of events as I capture them, different drawings done in different places butted up against each other. I’ve been doing these morning edm drawings in a specially designated book, one per page and I have lost a lot of that antic energy I like. So on our trip to Appalachia, Jack and I are both drawing in smaller moleskines and I’m using a smaller pen (usually a PITT XS). I have my super tiny paint set and a water brush. It’s a whole new set of challenges using a finite set of art supplies and tiny ones at that and it is making things new again. All that is of course multiplied by being in a new place and seeing things through fresh eyes. Some of it is very annoying, particularly trying to use my phone, my iPad and any available wifi to post these drawings to my blog but it’s all party of the adventure. 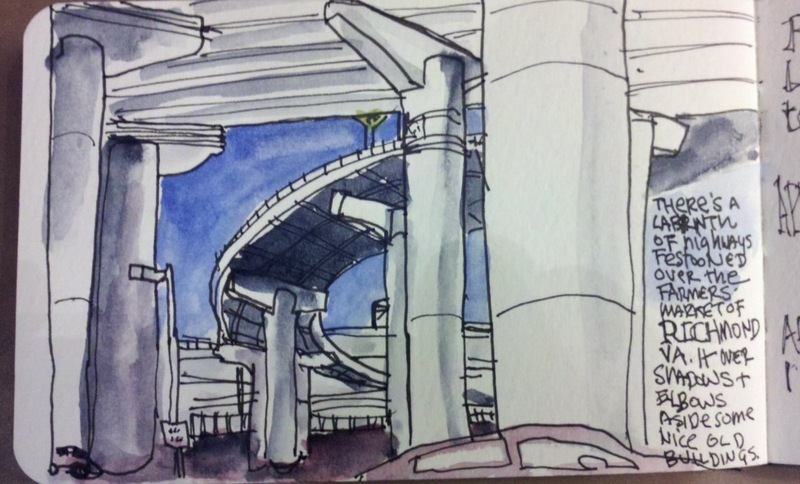 Particularly enjoyed your sketch of the freeway labyrinth. Wouldn’t have thought of sketching something like that myself. Another idea to try. I also appreciate the various tools you mention – being a beginner, it’s good to hear what other folks use and like, the pros and cons, etc. Enjoy the trip! I have driven that labyrinth!!! Great sketch. Great sketches on a great (probably my favourite) sketchpad. Smaller sketch pad are so good to bring in the pocket! I love also to have always with my micro kit home made, with only 6 colors. It’s funny to challenge ourself in that way. I even also made a small paint set made only with these colors: gold and burnt sienna, raw and burnt umber, indian red and ultramarine. Just imagine! Like this adventure you are on with new tools (my tools!) and your “view” of the world under the freeway! Looking forward to more of the same! I really enjoy your combined sketches. It does give a vitality to the page! What paints did you bring? I’m always interested in other peoples paint selections. The smallest Moleskine and a thin sharpie and an ebony pencil are all one needs. We just returned from the Channel Islands and those three tools plus a traveler’s watercolor kit were sufficient. I think if you have less tools at your disposal, you will expand the possibilities of those you do have. I always enjoy your blog and love your book, “Every Day Matters.” Thanks for being you, Danny.